Physical vapor deposition (PVD) is a vacuum coating process in which the surfaces of various products such as microelectronics, cutting tools, storage devices, medical equipment, solar products, etc. are coated with materials to form a thin protective film. Manufacturers are increasingly giving preference to PVD coating over conventional coating techniques due to the environment-friendly properties of the PVD process along with other operational benefits. Furthermore, companies are adopting innovative technologies in order to differentiate their products in an increasingly competitive market scenario. The global physical vapor deposition market has been boosted by a number of drivers such as the rising demand from the electronics industry, which has adopted physical vapor deposition on a large scale. The growing demand for microelectronics in a number of application areas such as the automotive industry is also vital for the physical vapor deposition market. The global physical vapor deposition market is anticipated to grow at a fast CAGR of more than 8% during the forecast period. According to Transparency Market Research, the global physical vapor deposition market was valued at US$16,410.9 mn in 2016 and is projected to reach US$33,335.2 mn by 2025 at a CAGR of 8.3% from 2017 to 2025. The global physical vapor deposition market can be segmented based on category, applications, and region. On the basis of category the physical vapor deposition market is segmented into PVD equipment, PVD services, and PVD materials. PVD equipment mainly comprises vacuum, heating, condensation, and coating equipment. PVD equipment dominated the global market in terms of revenue in 2016. The market revenue share of PVD equipment stood at above 50% in 2016 and is expected to experience significant growth in the coming years. PVD services include installation of equipment and coating services. Growth in end-use industries such as microelectronics and solar is projected to drive the PVD services market. PVD services is estimated to emerge as the fastest growing segment during the forecast period. PVD materials include various raw materials such as titanium, aluminum and nitrogen. Physical vapor deposition is used for a broad range of applications such as microelectronics, data storage, solar products, medical equipment, cutting tools, architectural glasses, and others. Microelectronics is one of the leading application segments for physical vapor deposition (PVD) and held more than 40% of the global physical vapor deposition market in 2016. Rapid expansion of the microelectronics segment has thus been a major factor driving the PVD market. Demand for PVD for cutting tools applications is projected to increase at the fastest rate during the forecast period. PVD coatings are widely employed on cutting tools in order to provide excellent wear resistance, advanced oxidation resistance, increased cutting speed and feed rate, etc. Asia Pacific held the largest market for physical vapor deposition, with a share of more than 40% in global figures in 2016. China, India, and Japan are expected to dominate the demand for physical vapor deposition in Asia Pacific. 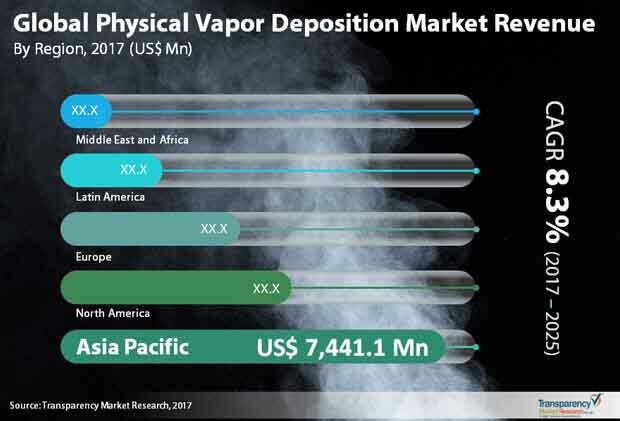 The Asia Pacific physical vapor deposition market was valued at US$7,441.1 mn in 2016 and is likely to near double in valuation over the 2017-2025 forecast period at a robust CAGR of 8.6%. North America constituted the second-largest market for physical vapor deposition in 2016. Growing use of PVD in microelectronics application is likely to boost demand from the physical vapor deposition market in North America. Following North America, Europe accounted for more than 19.0% of the total market revenue in 2016. Demand for physical vapor deposition is comparatively low in Latin America, the Middle East, and Africa. However, rise in demand for PVD in manufacturing of architectural glass and low-e glass is anticipated to provide lucrative opportunity for PVD in the Middle East and Africa during the forecast period. Key manufacturers in the physical vapor deposition market are Platit AG, Mustang Vacuum Systems, Oerlikon Balzers, Veeco Instruments Inc., Applied Materials, Inc., ULVAC Inc., Semicore Equipment, Inc., HEF USA, Singulus Technologies AG, IHI Corporation, Silfex Inc. (Lam Research Corp.) and Buhler AG. Physical vapor deposition (PVD) is a vacuum coating process in which the surfaces of various objects or metals are coated with materials to form a thin protective film. This coating exhibits higher strength, durability, and corrosion-resistant properties, as compared to conventional coating process. Expansion of cutting tool and microelectronics industry is anticipated to provide lucrative opportunity during the forecast period. PVD coatings are widely employed on cutting tools in order to provide excellent wear-resistance, advanced oxidation resistance, increased cutting speed & feed rate, etc. Furthermore, rise in demand for PVD in manufacturing of architectural glasses is also anticipated to boost the PVD market. Moreover, environment-friendly characteristics of PVD make it a preferred choice over its substitutes. Manufacturers are increasingly using PVD techniques due to the environment-friendly properties of the PVD process along with other operational benefits. However, patent protected technology along with high investment costs are likely to hamper the expansion of the global physical vapor deposition market in the near future. This report provides detailed analysis and forecast of the physical vapor deposition market on a global and regional level from 2017 to 2025. The market has been forecast based on revenue (US$ Mn) from 2017 to 2025, considering 2016 as the base year. The report includes drivers and restraints coupled with their impact on the market growth during the forecast period. Furthermore, the study encompasses various opportunities for growth of the market at the global and regional and country level. The report thoroughly analyzes the value chain to provide detailed understanding of the market. Additionally, it covers Porter’s Five Forces Model, which offers an insight into the intensity of competition in the market. The study also comprises market attractiveness analysis, wherein various types are benchmarked based on their market size, growth rate, and general attractiveness. We conducted in-depth interviews and discussions with numerous key industry participants and opinion leaders for the research report. Primary research represents the bulk of our research efforts coupled with extensive secondary research. We reviewed key players’ annual reports, product portfolio, press releases, and relevant documents for competitive analysis and better understanding of the market. Secondary research includes in-depth research on current trends, technical writing, recent trade, Internet sources, and statistical data from government websites as well as associated and authorized agency websites. This proved to be the most successful, effective, and reliable approach for obtaining concise data, capturing industry participants’ insights, and recognizing opportunities and growth. The market has been segmented based on category and applications. Each segment has been analyzed and forecast based on revenue (US$ Mn) from 2017 to 2025. Additionally, segments have been analyzed and forecast based on current trends at the global and regional level. Geographically, the market has been segmented into North America, Europe, Asia Pacific, Latin America, and the Middle East and Africa (MEA). Demand has been analyzed and forecast based on current trends for the next eight years. Key manufacturers in the physical vapor deposition market are Platit AG, Mustang Vacuum Systems, Oerlikon Balzers, Veeco Instruments Inc., Applied Materials, Inc., ULVAC Inc., Semicore Equipment, Inc., HEF USA, Singulus Technologies AG, IHI Corporation, Silfex Inc. (Lam Research Corp.), and Buhler AG.